June 2015 Update: Following completion of this project, I had reason to build a second one, and as is normal improvements came to light. 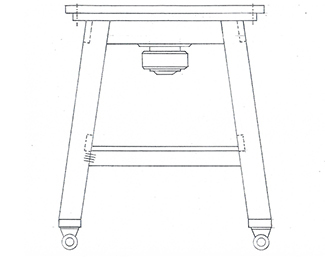 In stabilizing the assembly for the router lift, it is not necessary to angle the front legs, since in this particular case the possible instability is at the rear – not the front. Joining the front legs at 90 degrees to the side rails also provides additional leg room for the operator. 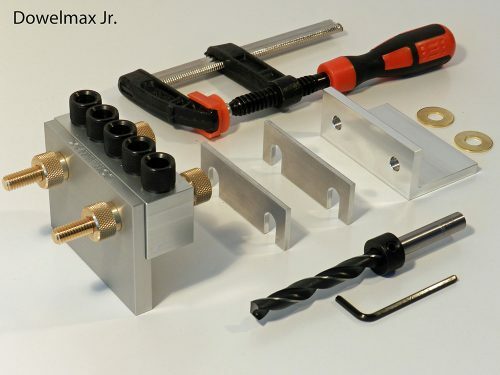 I recently purchased a steel metal stand for my router table. The design incorporated steel square section legs perpendicular to steel L section cross members at the middle and top. Stability might not seem like an issue under normal circumstances, however for my requirements, I require a table which is rock solid on terra firma. In terms of mobility, my shop is medium in size, and it is essential to have equipment that can be mobile when required. In terms of cost, the steel stand I purchased was fairly expensive, and I knew I could design and build one for a fraction of the cost. In doing so, I knew I could eliminate all of the aforementioned problems. The purchase price of the steel stand including taxes was approximately $200., whereas I built the entire new stand (excluding castors) from four 2 inch x 4 inch x 12 ft framing studs at a total cost of $24. 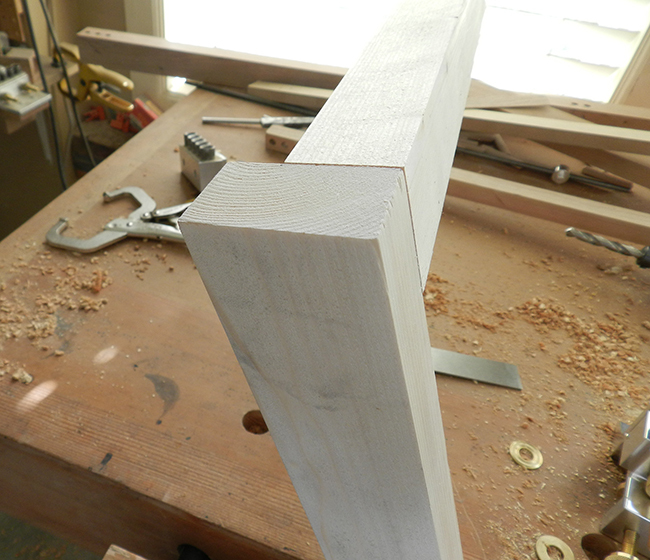 I bought several 2 x 4 x 12 ft wood framing studs and milled those to 1-1/4 inches x 2-7/8 inches. Any of the table dimensions can be increased or decreased depending on the actual requirements. 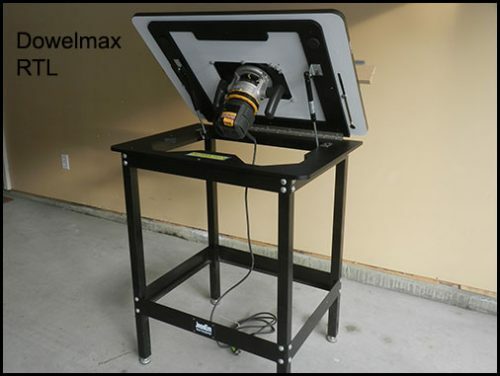 The table can be configured to meet the requirements for any set up including a lathe, a radial arm saw, a drill press, a planer or any other piece of stand mounted woodworking machinery. At the outset I tried to increase the table’s stability by creating a trapezoidal angled design(front to back only). I began with a small 3 degree angle – to minimize interference with the stand legs and the operator at the lower section. I then built the entire structure, and then dry-fitted the framework. However, when I then used the router table, I still noticed some slight instability, and decided to increase the angle to 5 degrees. Using trigonometry and related tables, this increased the spread at the bottom to 4.5 inches. NOTE Dowelmax automatically adapts to any angle joint. In the case of the front to rear rail, that component is cut at a 5 degree angle. Dowelmax drills perpendicular to the face, but at 5 degrees to the board axis. We use 2 inch dowels for this project, and would not under any circumstances recommend using biscuits or pocket holes for construction of this stand. When milling the legs and rails in the table saw use extreme caution; if possible, install a riving blade and never place hand behind blade to steady or position work piece. Use a fingerboard or push-stick. 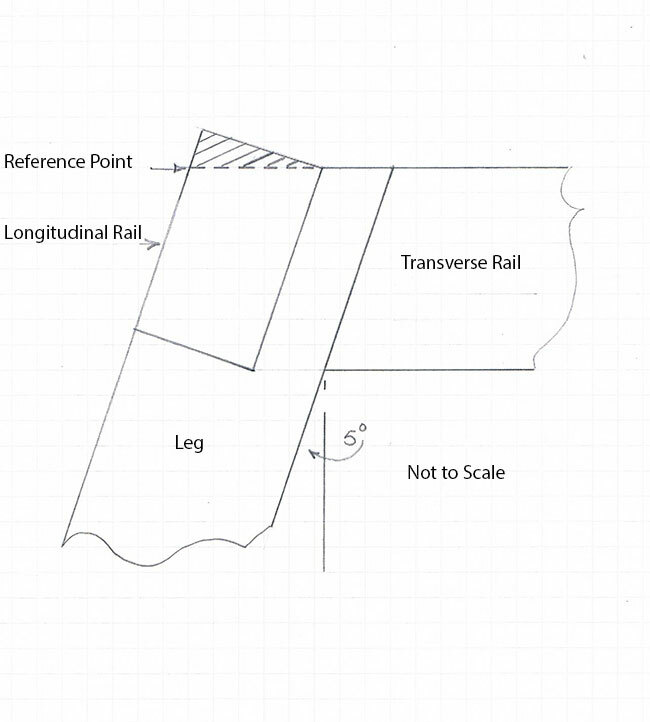 When referencing the upper transverse rail to the end frame, remember the end framework is in trapezoid form to an extent caused by the 5 degree angle cuts. 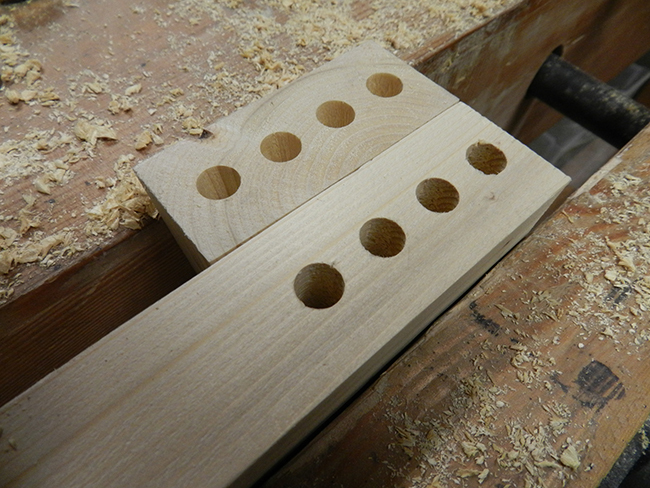 Reference Dowelmax to the upper edges of the transverse rail and leg, and drill the four joint holes. NB. Dowelmax automatically adapts to the 5 degree angle. The upper and lower rails at either end of the table are referenced as normal, and fitted flush with the legs at a 5 degree angle. With respect to the front and rear rails, the upper rails are flush and the intermediate rails are offset and form part of the shelf assembly. 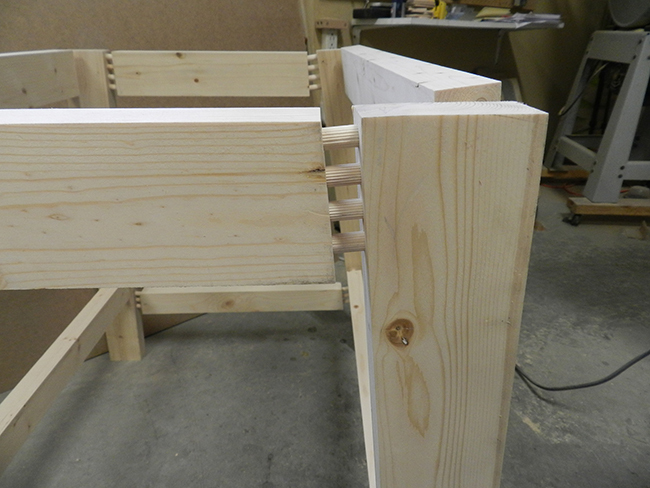 The two lower rails are flush with the inside edge of the legs, and are referenced from the inside edge surfaces. A face joint is now required on the inner face of the leg. For this application, change Dowelmax to the face joint configuration. The discrepancy created by the 5 degree angle is as shown on the accompanying sketch. I used a digital angle gauge set at 5 degrees to scribe a line on the end of the rail (from the inner corner:shaded area). Align Dowelmax to the upper outer end of the leg, and the lower point of the shaded area, and drill the required number of holes. 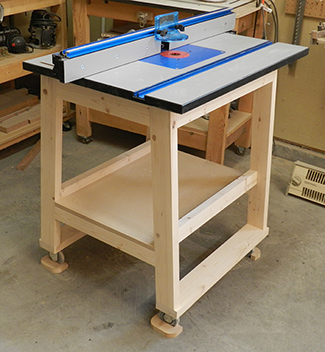 Set table saw at 5 degrees and cut full length of rail until top is flush with upper part of leg. 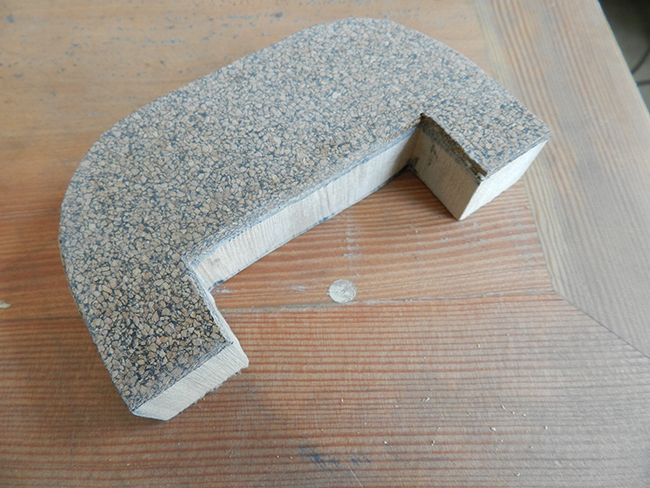 The finished joint is shown below. 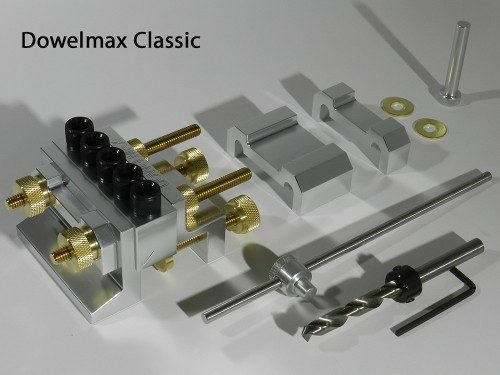 The front and rear intermediate rails are face joints, and Dowelmax has to be reconfigured to the second configuration (see video) in order to complete face bores. The caster supports were milled 1-1/4 inches x 3-3/8 inches x 26-1/2 inches and protrude front and rear. 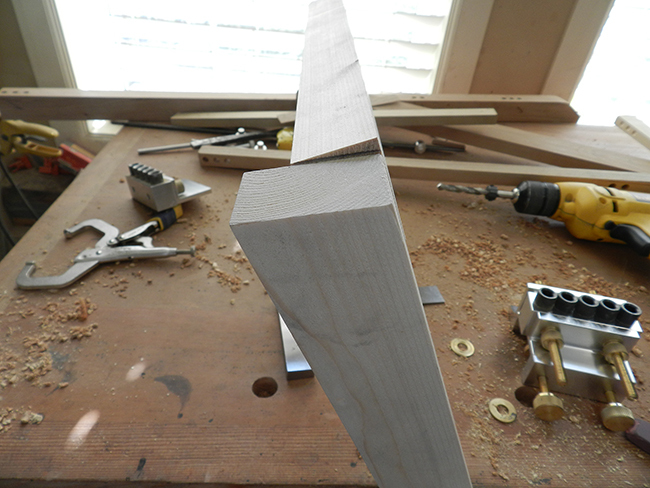 I don’t like using screws on long grain, however these joints are always in compression, so use #8 – 2 inch screws to secure the supports to the lower leg ends. 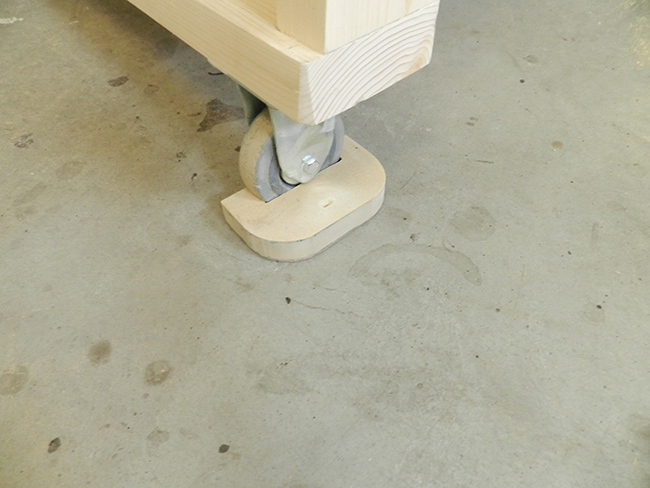 The castors are then aligned and screwed to these horizontal supports. 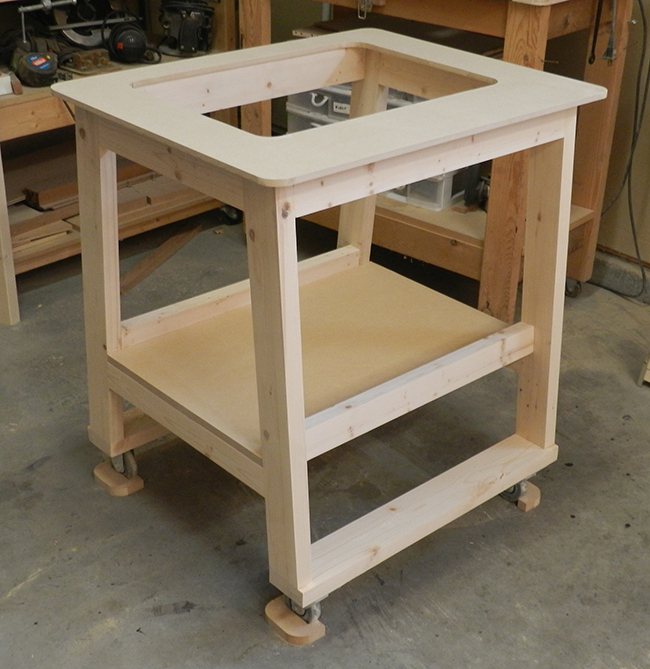 The upper finished measurements of the stand are 20-3/8 inches x 26-1/2 inches. I then secured a top plate (MDF) to the stand. The router top is then secured to the stand top plate using wood screws. The table must be stationary when in use, and the most appropriate way to ensure this would be to attach screw jacks to the sides of the castors. I was unable to locate suitable jacks, so I devised an alternate way to anchor the stand in position. These only have to be installed when the router is in use, and consist of four rubber backed castor locks. These should be snuggly fitted under each wheel. I had cork gasket material on hand, and so utilized that material with the locks.